Plain plumaged mimic with a bold personality. Common year-round through much of North America; prefers grassy, shrubby areas like parks, suburbs and forest edges. 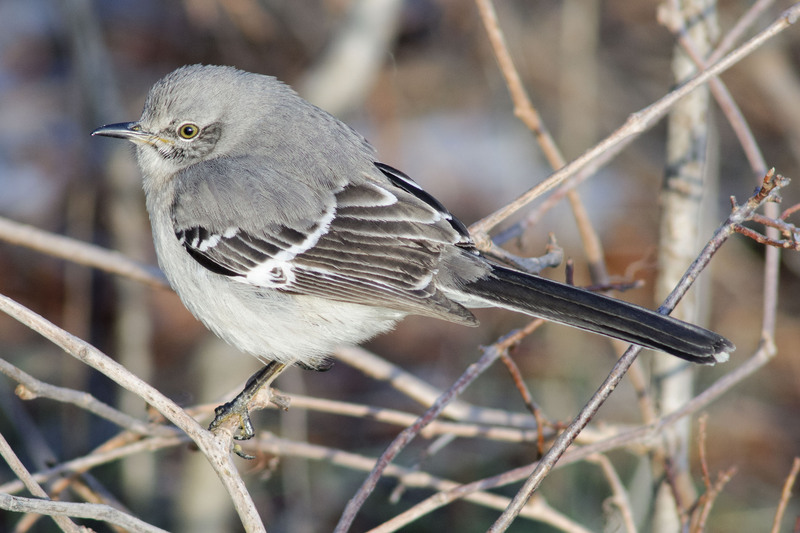 Mid-sized, lanky songbird with long tail; thin, slightly down-curved bill; rounded wings with white patches; gray above and paler below. Often perched out on a bush, wire or fence and aggressively defends territory. Adults may imitate up to 200 bird songs; very vocal in spring and fall, even at night; females also sing. Diet of insects and berries. Typically nests in low shrubs or trees. Lifespan up to 14 years. Population ~ 32 million and declining; formerly a popular cage bird.